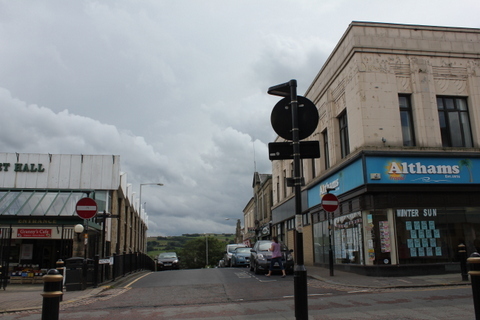 Colne sits on the top of the hill and involves drawing up or down hill whichever way. It has no high viewpoints such as upstairs cafes. 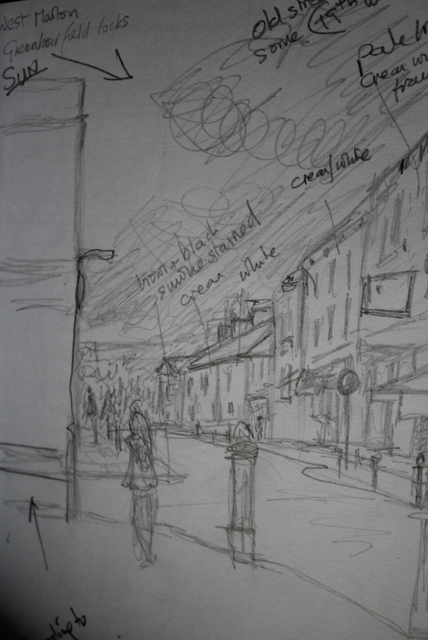 This drawing was down from the quiet end of the main street, infront of the Parish church. It was a very hot day and there was a lot of traffic both vehicles and people walking past. 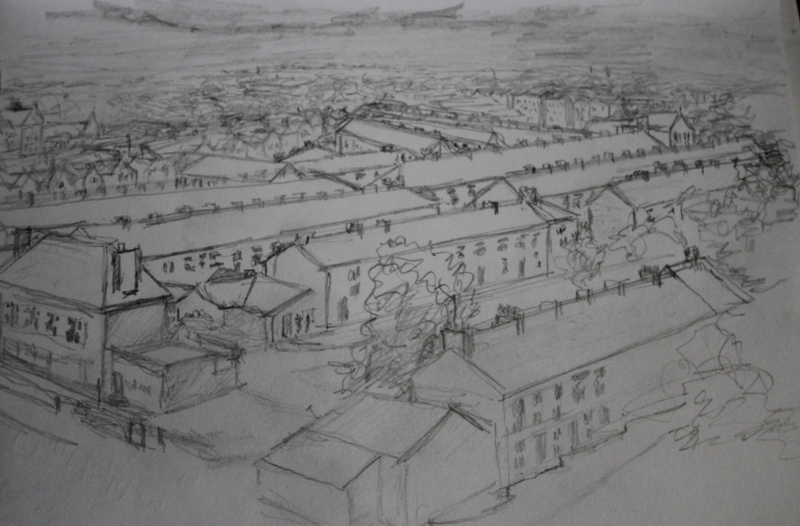 I like the drawing -not only does it reflect the way the town bends onto the brow of the hill, but the felt tip and business of the lines reflect the activity of the day. 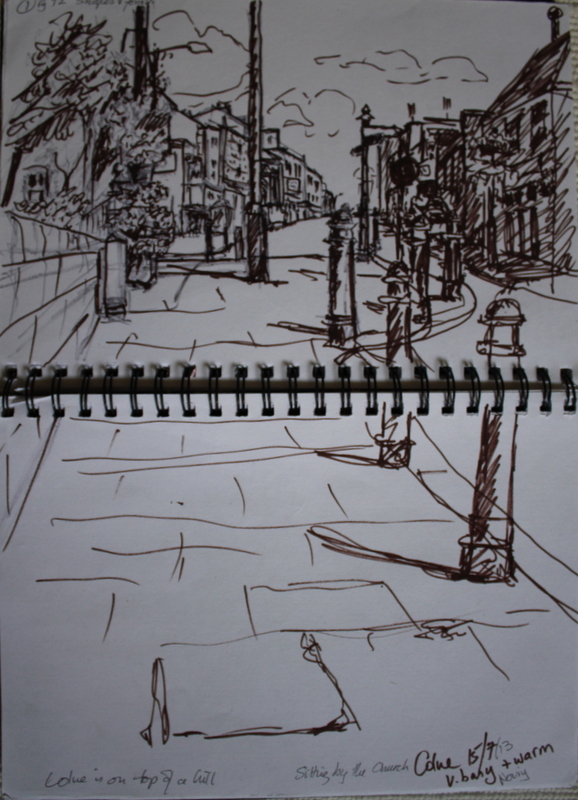 It was started in black felt tip -which ran out and so had to be touched up further with brown felt tip -I think this adds to the chaos and noise of the street. “The village” Sitting quietly in the shade, this picturesque village was quiet, apart from the occasional car or tractor. 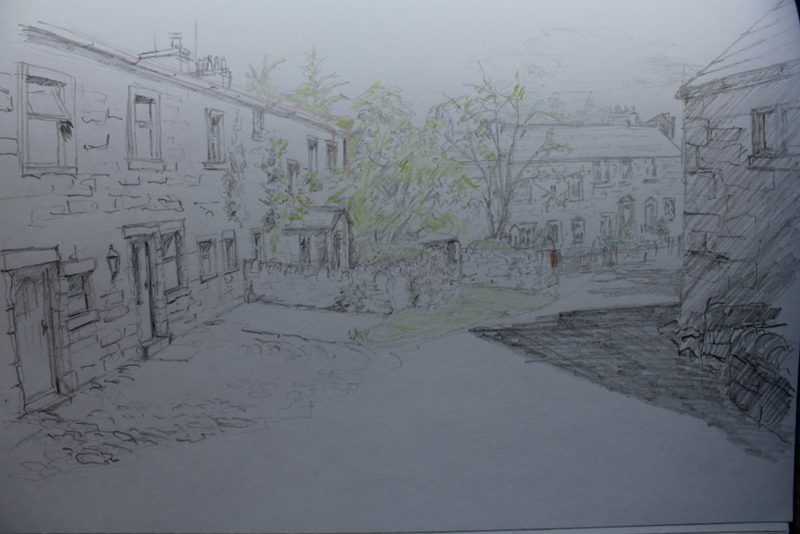 The day was hot and I sat for several hours before lunch, drawing in a light pencil to reflect the peace and delicacy of the village. The street went slightly down hill so the eye level was amidst the trees in the middle of the picture. The bricks are soft crumbly cream stone and the buildings on the left in full sunshine, with a deeper orange shade on the right. There was a hint of red in the form of a post box on the wall and the garden trees were light and airy. (both marked by a hint of colour)… no-one else was to be seen although through open windows the cricket commentary could be heard. 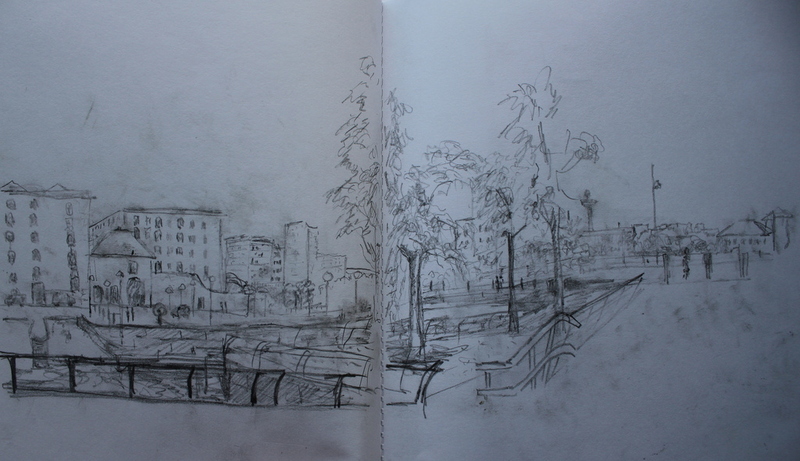 What better way to spend lunchtime in the shade of an outdoor restaurant drawing the Liverpool docks. Unfortunately having lots of problems with the putty rubber which was almost melting in the heat! Another relaxed warm sketch before the trip to the Chagall exhibition. Warm overcast 11a.m. no people down this street. Right side in shadow -blues browns greys, left in sunlight. Red and grey houses in distance going back up the hill. Lots of trees dottted between the houses and brown hills beyond. 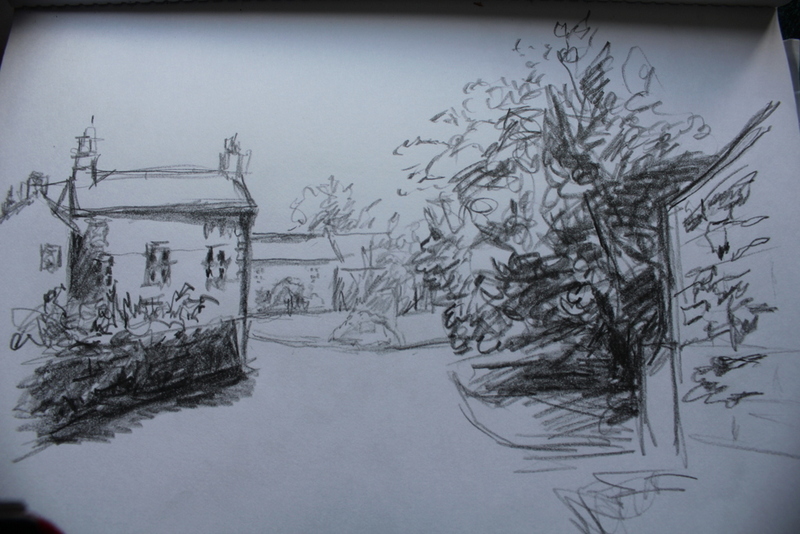 I have a fscination with rows of houses and chimneys and I would like to use this to turn into the limited palette study –however this was drawn looking through the window of the health centre to which it is not easy to return without reason. deep dark shadows in conte crayon. Little traffic, no people. 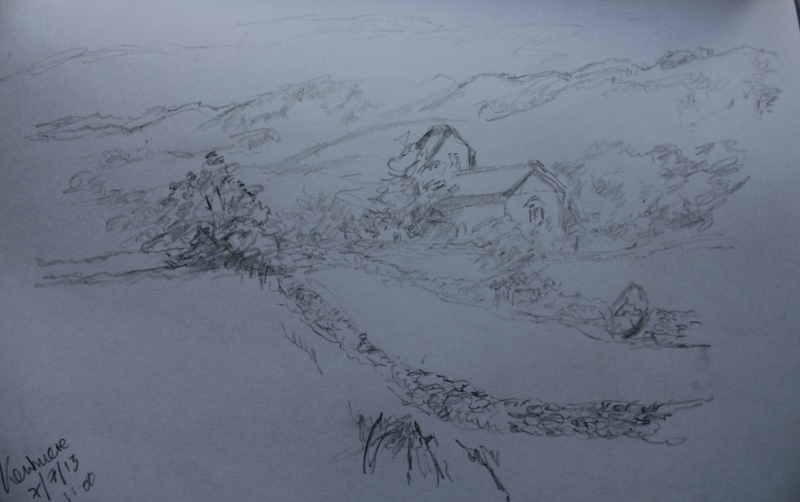 drawn quickly in fine pencil whilst waiting for friends for a walk into the hills. Trentmere church. A selection of sketch book drawings done with the intention of changing into a limited palette study. The weather had changed and was overcast, warm and threatening rain (later thundered and lightened). The time was early afternoon. 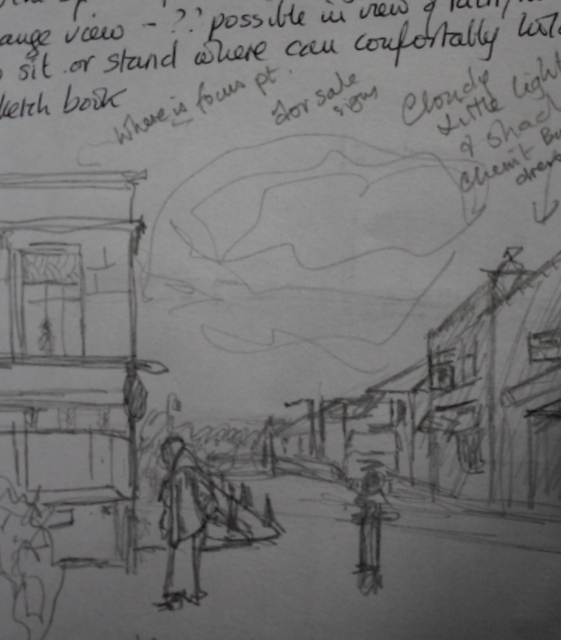 I wandered round trying to find a useful place to perch to draw and was joined by several people out for a chat or smoke. 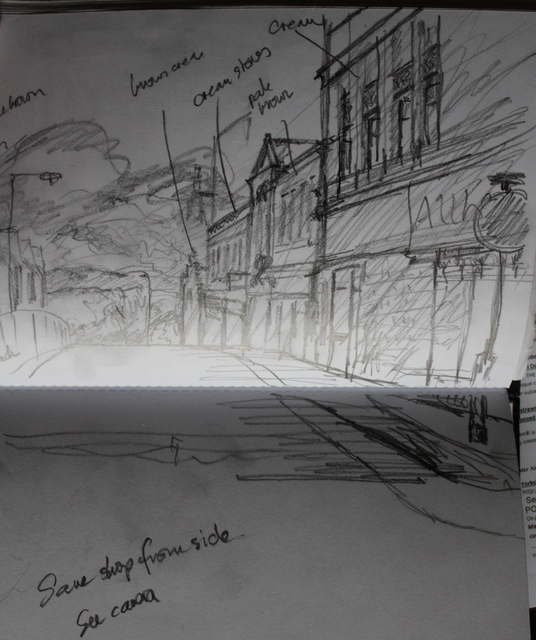 I drew the centre of Colne, a building built in art nouveau style so probably in the early 1900s which I was informed used to be a gents outfitters and is now a travel agents (which seems quite a “come down”, from there I drew the main street going down past the front of the shop and the side street going down at the side of the shop (with hills in the distance). The street was relatively busy and vans kept parking and blocking my view, people meandered up and down. The building itself is quite beautiful and I can imagine it in its hayday when it was a “classy” outfitters with rounded large windows at ground floor . On the other side of the main street are buildings of the same age and much older–the position of these buildings (if not the same ones ) has been the same for centuries as the street goes over the brow of the hill to the Church (1300 A.D.). 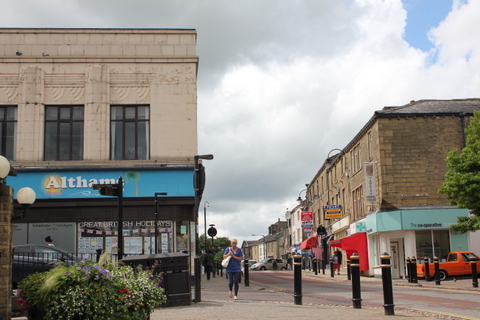 There is a butchers, a chemist, a dress shop and several “for sale ” notices attached to some of the facades. 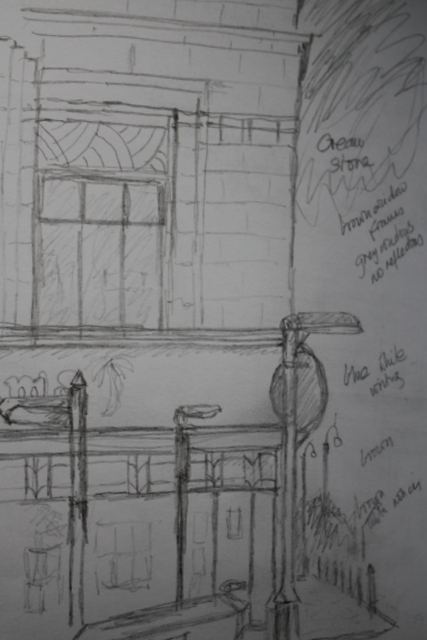 What was a common old garden building started to develop history and character as I drew and was offered information from bystanders. 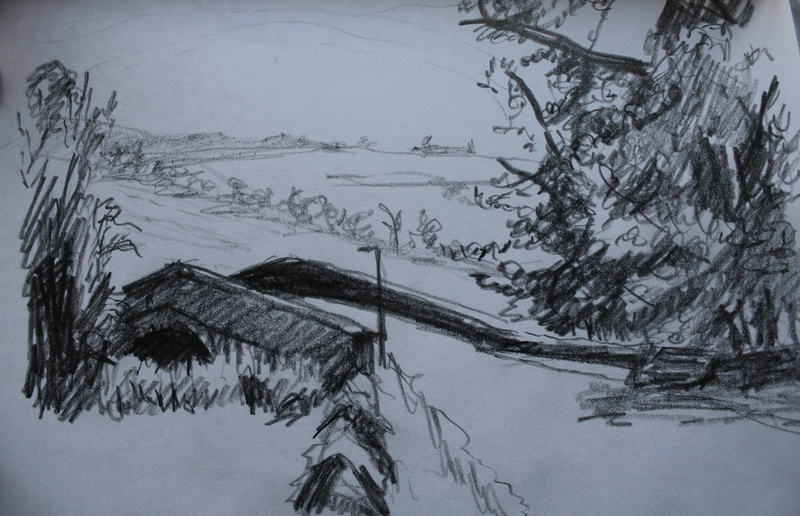 There was little shadow as no bright sunshine and the sun was almost directly overhead (marked position on one of the sketches). I found that much of the relative sizes and proportions had not been carefully analysed on the original drawings and hence I resorted to the photographs. As suggested I decded to draw in ink and then added pastel-for which I chose most of the colours! 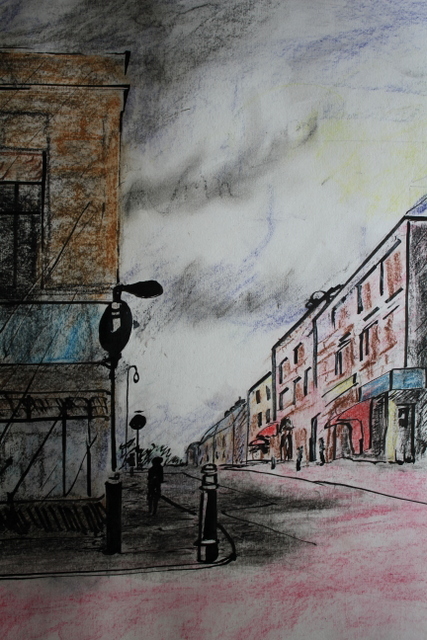 Theink drawing turned a quaint shopping street into a technical but wobbly harsh black and white drawing and the pastels made matters worse with sickly colours. I am far from pleased with the result. 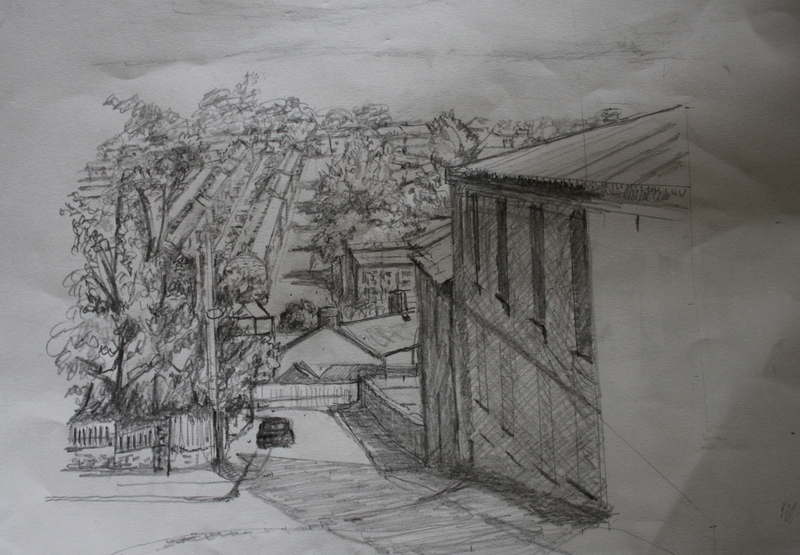 This entry was posted in Project Townscapes. Bookmark the permalink.